RatPac manufacture a range of wireless DMX systems to control lighting from a smartphone or tablet. RatPac products are designed for professionals in the Film, TV, Studio and Entertainment industries. RatPac Dimmers started when a rigging gaffer and an electrical engineer determined to design a dimmer that would be quiet enough to use on the set. 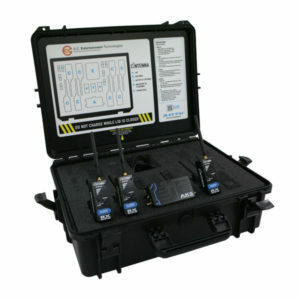 They then expanded their product range to include wireless lighting control systems. Their Cintenna system uses LumenRadio’s CRMX wireless lighting control technology. With a custom wireless hub together with receivers that plug directly into a lighting fixtures XLR port and that don’t need any external power supply, fixture can be controlled through a proprietary app that allows users to control lighting levels directly from their smartphones or tablets.